So I pretty much have permanent ringing in my ears, for those of you mothering types out there saying "go to the doctor you idiot and figure out what is wrong!" I have done that and the answer is nothing. So I just grin and bear the fact that my ears ring when it is silent. 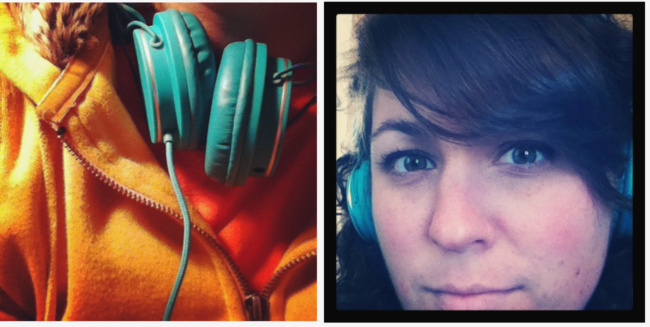 So what do I do to combat that ringing.... why I get a flashy pair of turquoise headphones of course!! Pretty rock star, huh?!?! Yeah I know I am crazy and this doesn't solve my problem but it does allow me to ignore! I have that too. fortunately not all the time. mostly when i'm stressed (so lately it's mostly all the time). so i did the same thing - listening to music kind of all the time - with the effect that i have MUSIC in my head. which doesn't seem too bad but it actually is. there is music before i want to sleep and music when i wake up. and therefore i must say that i prefer the peeeeeeeep. after some time i even felt more stressed because it was never silent. just want to say: be careful sweetheart. Thanks lady, I know it can really serious and I am going to make an appointment with the doctor this week actually to address it again.